Melt 1 tbsp. of the butter in a sauce pan, add the red currant jelly. Heat until the mixture is smooth. Mix in the tamarind syrup, ketchup and wine. Heat until the mixture just starts to bubble around the edges. Take the pan off the stove and mix in the remaining ½ Tbls. of butter. If you are using wooden skewers soak them in water for ½ hour prior to assembling the products. 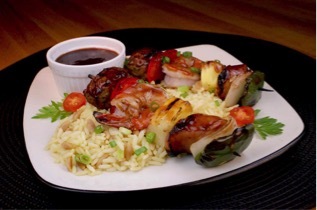 Place the items on the skewer in the following order – Meatball, Red Pepper, Shrimp, Pineapple, Sausage, Onion and Green Pepper. Place the skewers on a grill over medium high heat and cook for 4-6 minutes until the shrimp turns bright pink and the products are heated through. Light brush the items with the sauce, remove from the grill and serve with more of the sauce on the side.